Food addiction is a serious medical condition. Similar to drug addiction, the symptoms of food addiction can include difficulty controlling behavior, cravings, tolerance, dependence, withdrawal symptoms, and relapse. Unfortunately, many people who suffer from food addiction may hesitate to get help because the condition is often accompanied by feelings of shame, guilt, and low self-esteem. Is there a cure for food addiction? 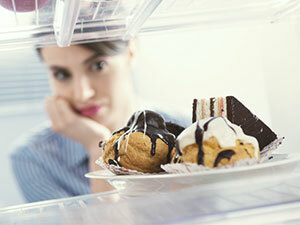 What are the symptoms of food addiction withdrawal? What are the benefits of residential inpatient treatment? What outpatient treatment programs are available for food addiction? Are luxury and executive rehab facilities available? What therapies are available for food addiction? What over-the-counter and prescription medications can treat food addiction? What 12-step programs and support groups are available? How can I find information on the best food addiction treatment centers? Help with any needed weight loss. Address other issues associated with the illness, such as shame and low self-esteem. When people think of withdrawal symptoms, they typically think of substance abuse. However, food addiction has been shown to have its own associated withdrawal symptoms. Some people with food addiction may have no withdrawal symptoms, but others can experience a variety of symptoms. Withdrawal symptoms vary depending on the foods eaten and the person’s body chemistry. If you’d like to learn more about food addiction treatment options that include detox, call a treatment support advisor at . Residential inpatient food addiction treatment centers are available for those suffering from food addiction or another eating disorder. When people commit to a residential inpatient food addiction rehab program, they live at the facility and remain there 24/7 for a designated period of time. A starting length of treatment is typically 28-30 days, but programs can be 60, 90, 180, or 365 days in some cases. Absence of the triggers and stressors of the outside world. Scheduled and carefully portioned meals, which reduce the possibility of binge eating. No need to worry about transportation to and from treatment. Supervised detoxification, medication-assisted treatment, therapy, and support groups. The support of peers facing similar addictions. Outpatient food addiction recovery centers are similar to inpatient programs. The treatments offered are typically the same, but care takes place on a part-time basis. Ocean or scenic view rooms. Swimming pools and hot tubs. Other alternative and complementary therapies. If you need help deciding which type of food addiction treatment center is right for you, call our helpline anytime at . Cognitive behavioral therapy (CBT): CBT techniques teach people trying to overcome food addiction how thoughts and feelings can impact behavior. This therapeutic approach typically focuses on moderation rather than avoidance or abstinence from foods. It teaches coping skills and relapse prevention techniques, and identifying triggers for addictive behavior. Dialectical behavior therapy (DBT): DBT was developed as a treatment for borderline personality disorder, but it has also proved effective at treating food addiction. Through DBT, people can learn how to tolerate stress, regulate their emotions, and improve their relationships, which can reduce the desire to turn to food as a stress-reliever. Nutritional counseling: Nutritional counselors or dieticians can teach people with food addiction how to cultivate healthy eating habits. Because we need food to survive, a person cannot remain abstinent in the same way they could if they were in recovery from a substance use disorder. Interpersonal psychotherapy: Because binge eating can occur as a means of coping with relationship issues, teaching healthy communication skills and enhancing the quality of one’s support system can reduce the number of instances of binge eating episodes. Topamax (Topiramate): Topamax is an anticonvulsant drug that is usually prescribed to control seizures. It has been shown to reduce binge eating episodes, but it has side effects and risks, including dizziness and kidney stones. Antidepressants (SSRIs): Selective serotonin reuptake inhibitor (SSRI) antidepressants can also reduce the number of binge eating episodes. Researchers have hypothesized that it may be due to the drug’s improvement of mood, which may reduce the negative feelings that often trigger binge eating. These drugs can have a wide range of side effects, from nausea and drowsiness to sexual dysfunction and nervousness. Vyvanse (lisdexamfetamine dimesylate): Vyvanse is a stimulant medication typically prescribed to treat attention-deficit hyperactivity disorder (ADHD). It reduces appetite, and the Food and Drug Administration (FDA) has approved it for the treatment of moderate to severe binge eating disorders. However, it is a controlled substance and can be habit-forming. It also has side effects such as dry mouth, headaches, and insomnia. Support groups and 12-step programs help people work on overcoming food addiction. Many of the 12-step programs available use the same 12-step approach developed by Alcoholics Anonymous, where participants work through the steps with the help of a sponsor. Food Addicts Anonymous:Food Addicts Anonymous believes that food addiction cannot be cured by willpower or therapy alone and is a biochemical disorder rather than a moral or character issue. They approach food addiction recovery by abstaining from addictive foods, following a nutrition plan, and working through the traditional steps. Food Addicts in Recovery Anonymous: Food Addicts in Recovery Anonymous is an international fellowship for those who have experienced problems with food and eating. Their path to recovery follows the traditional steps among the mutual support of others recovering from food addiction. Overeaters Anonymous: Overeaters Anonymous is a fellowship of people who are in recovery from compulsive eating. Their goal is to abstain from compulsive eating and food behaviors through mutual support, shared experience, strength, and hope. Compulsive Eaters Anonymous: Compulsive Eaters Anonymous is designed for anyone seeking recovery from compulsive eating. The meetings use a structured, disciplined approach to recovery by accepting and carrying out each of the steps among the support of peers. If you or someone you love is suffering from food addiction, there is hope. To learn more about food addiction treatment centers near you, contact our recovery support hotline for information and assistance at .
. Olsen, C. (2011). Natural Rewards, Neuroplasticity, and Non-Drug Addictions. Neuropharmacology, 61(7): 1109-1122.
. Werdell, P. (2011). Is it Possible to Recover from Food Addiction? Food Addiction Institute.
. Zolfagharifard, E. (2015). Cheese really is like crack: Study reveals cheese triggers the same part of the brain as drugs. DailyMail UK.
. Food Addiction Institute (2016). Assess, Treat and Refer: On Assessment, Treatment and Referrals.